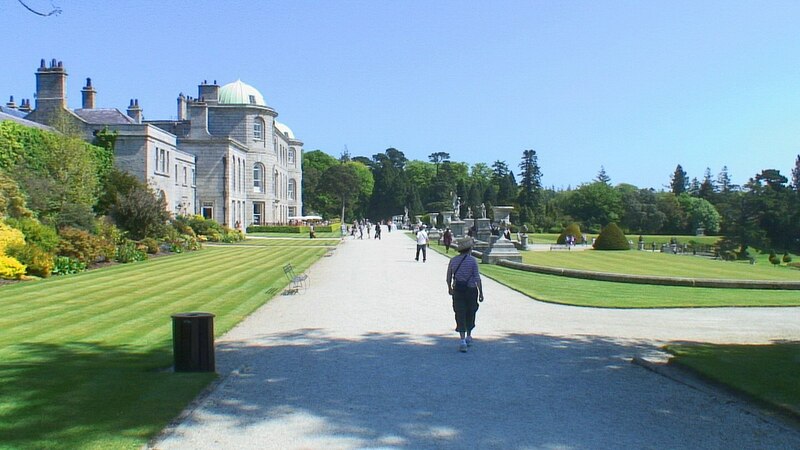 After touring the ancient monastic retreat in Glendalough, Bob and I drove up towards Kilmacanogue to visit Powerscourt Estate, the home of Powerscourt House and Gardens in County Wicklow, Ireland. 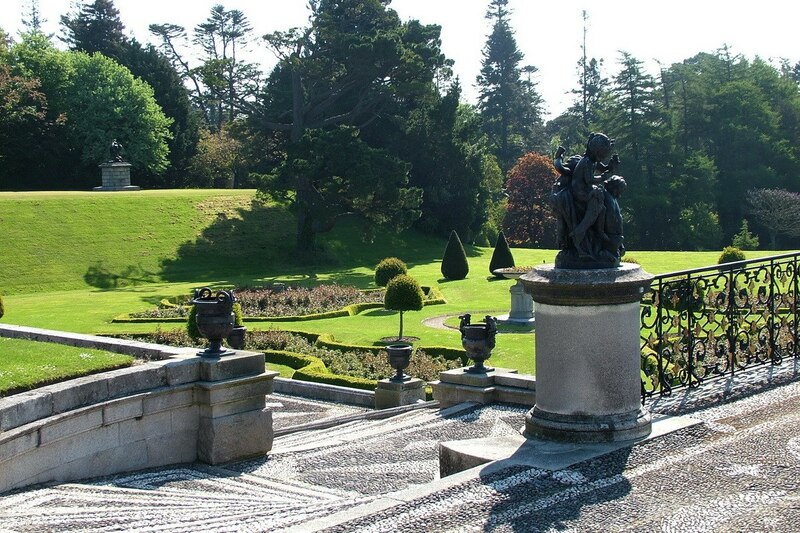 The Palladian mansion provides the perfect backdrop for the dramatic gardens and statuary that occupy the property. 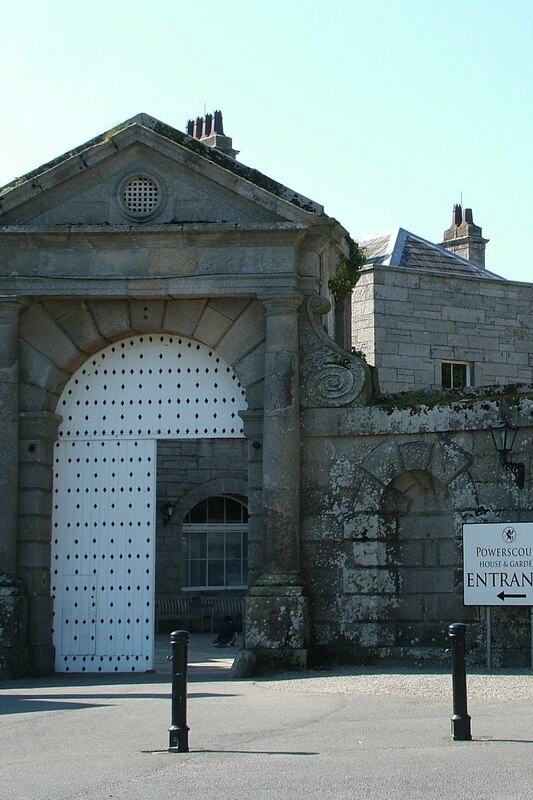 Where Powerscourt House stands today, there was once a 13th century medieval castle owned by the Le Power Family from which Powerscourt takes its name. 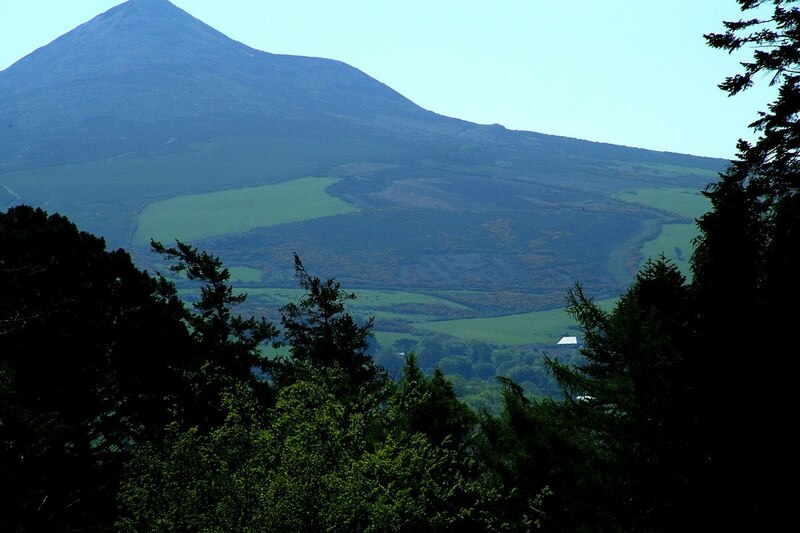 Powerful Irish families including the O’Tooles and the Fitzgeralds battled for possession of the castle and its lands over the succeeding centuries. 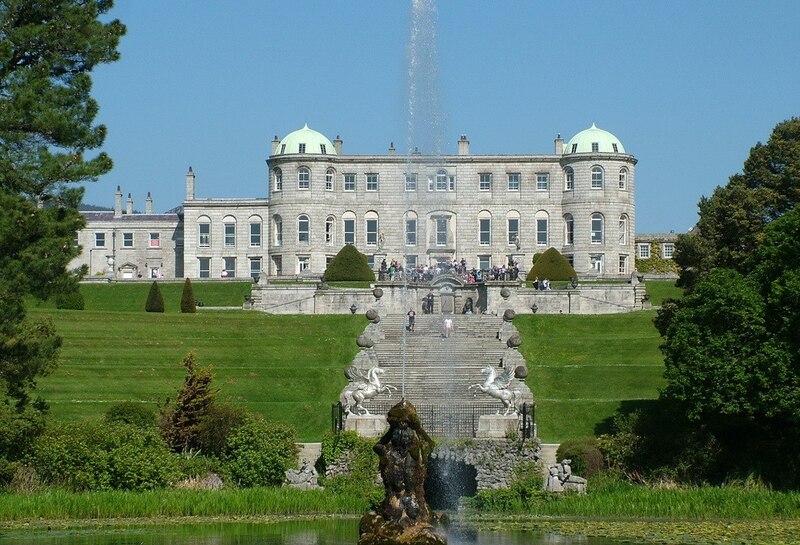 In 1603, a new era began at Powerscourt when Richard Wingfield was granted Powerscourt Castle and its lands as a reward for his military achievements by Queen Elizabeth. 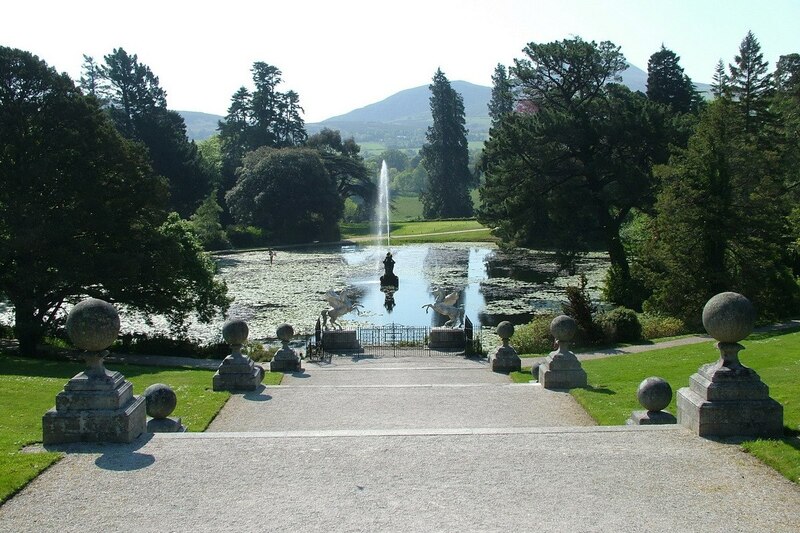 His descendants remained at Powerscourt for over 350 years. The simple austere appearance of the Palladian architecture at the entrance betrays nothing of the elegant and intricate gardens secreted behind the castle walls. We were in for a visual treat. 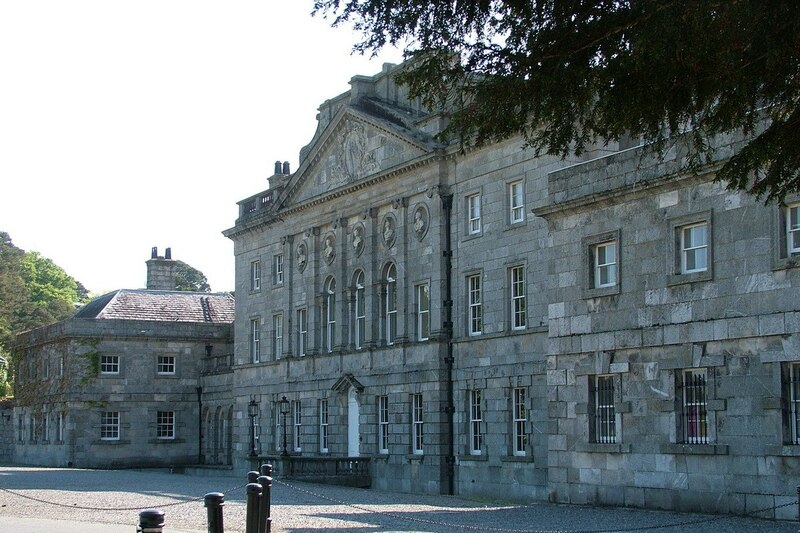 In 1730, a 68-room mansion was commissioned by Richard Wingfield, the 1st Viscount Powerscourt. 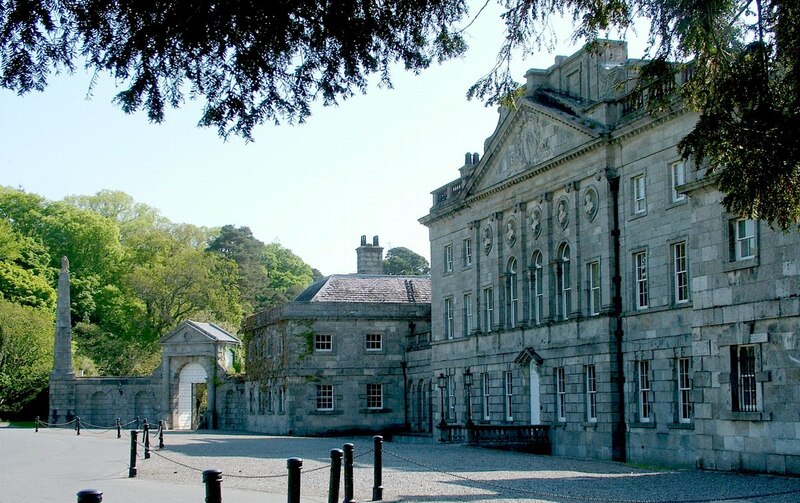 Powerscourt House, as it became known, was completed in 1741. 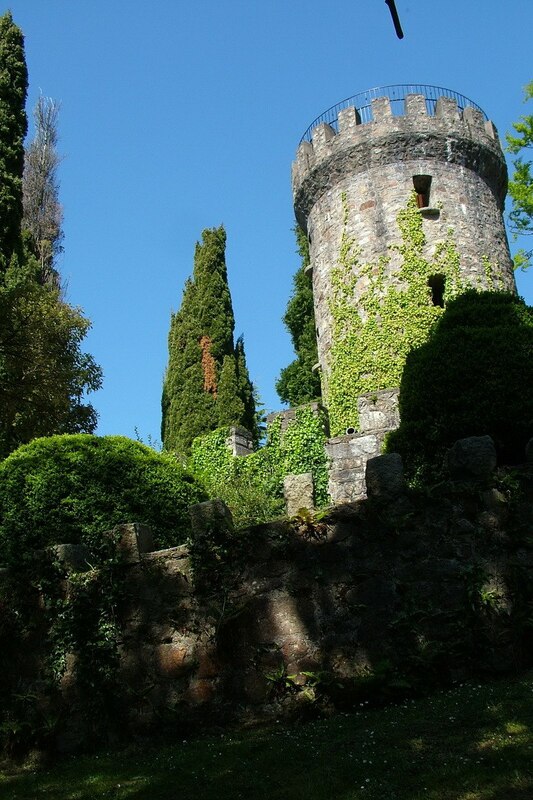 The mansion was designed around the original medieval castle. 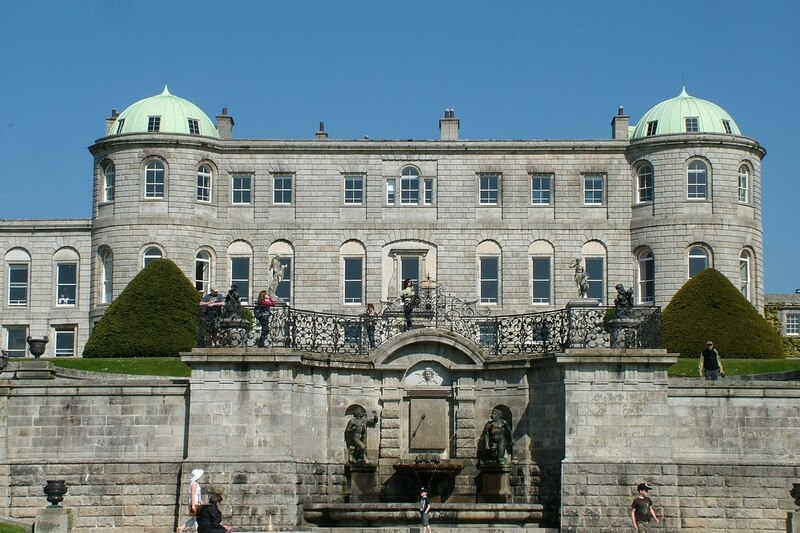 The north front was adapted to present a grand entrance in the Palladian manner, while the south front faced the gardens. Once inside the walls of the large estate, Bob and I realized that we would need quite a bit of time to tour the property. 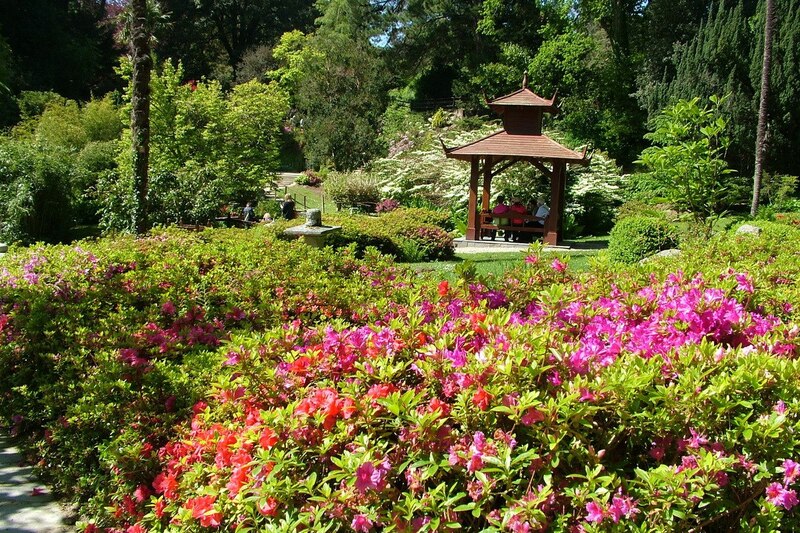 We wanted to be sure to see the Japanese Garden, Pet’s Cemetery, Walled Garden and Italian Garden. 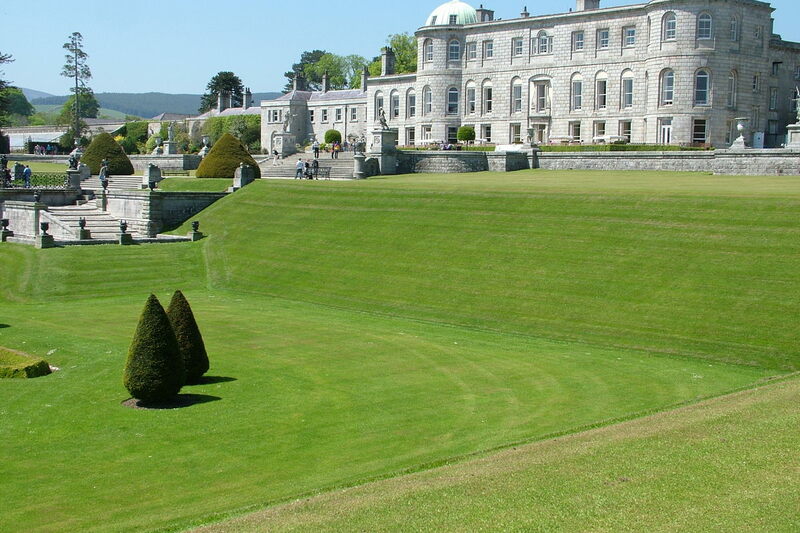 Powerscourt House sits at the edge of the Italian Garden, which is laid out on a series of terraces. The terraces, which link the house to the lake below, had to be cut into the steep hillside at the top of which the mansion sits. It took over twelve years to complete the feat. Gazing out over the Italian Garden, Bob and I had to admire the symmetry of the myriad flower beds. We could only imagine how spectacular they would be later in the season when they would be overflowing with flowers in bloom. 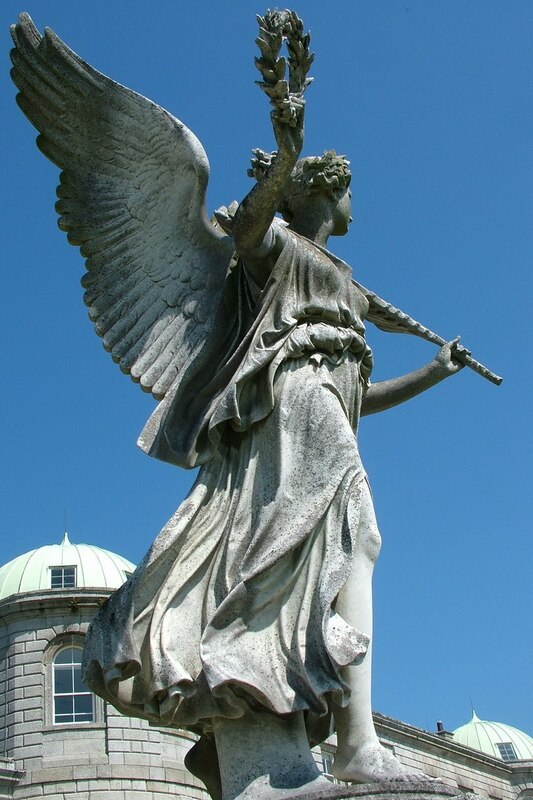 At the head of the terraces on the upper level, two impressive statues of angels sit atop substantial pillars. Bob and I were enthralled with the detail of the carving, the fluidity of suggested movement, and the sheer size of the figures. 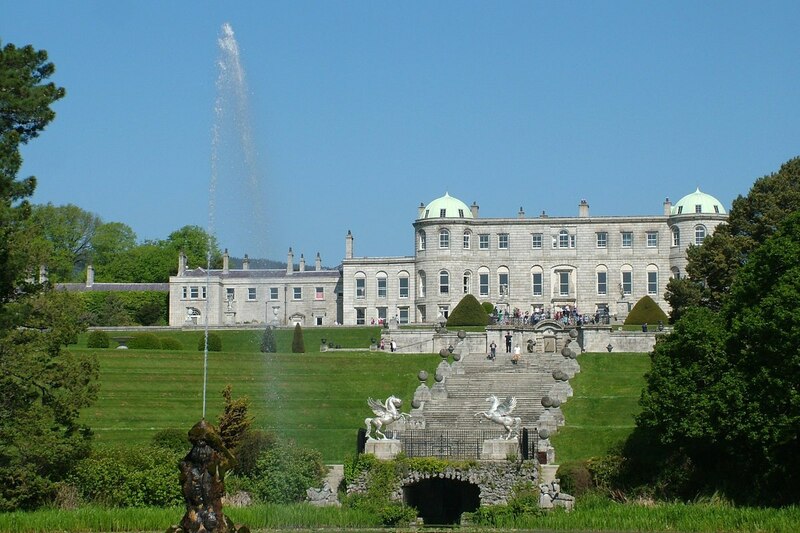 The Viscounts of Powerscourt traveled extensively throughout Europe, and often selected original pieces of work or commissioned replicas to be brought to their estate in County Wicklow. 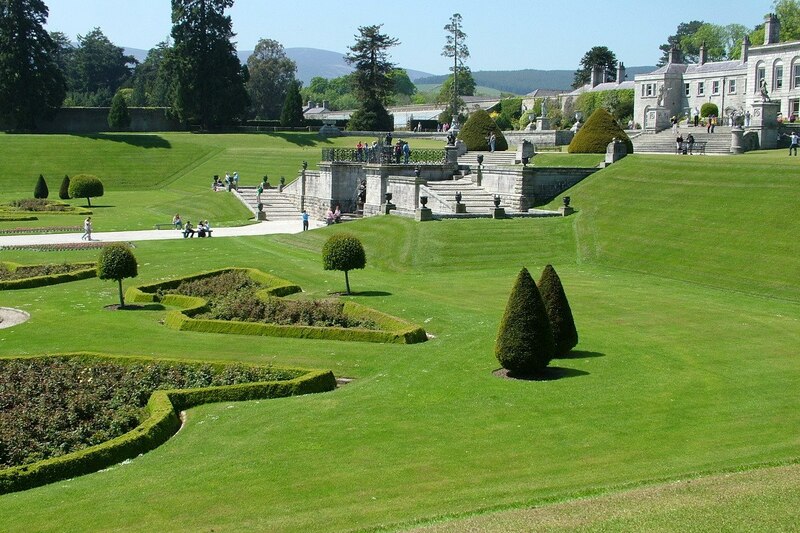 Their aim was to bring an international flavour to the Powerscourt House and Gardens. 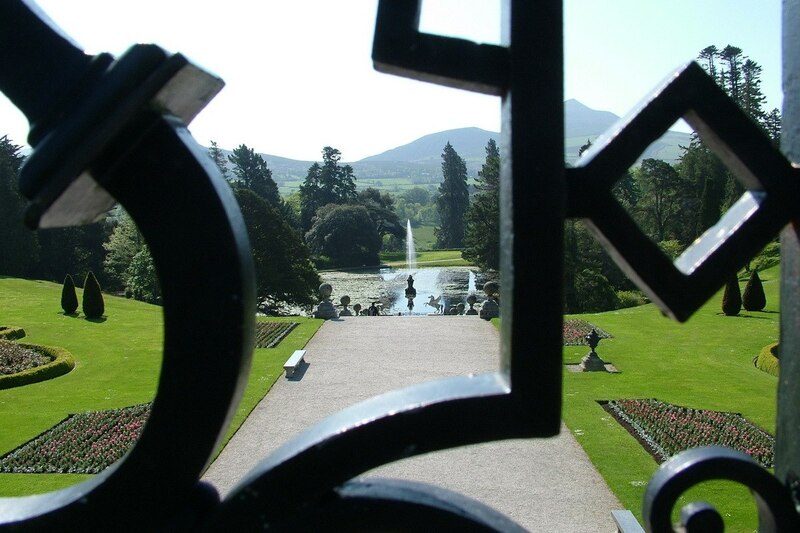 Looking from Powerscourt House out over the Italian Garden left us in awe. Designed so as to become part of the wider landscape, the grounds are nestled in the lush green valley at the base of Sugar Loaf Mountain. Our eyes were compelled to take in the stunning view of Lake Triton by the Italianate stairway (The Perron) that is symmetrically arranged and descends downwards to the edge of the ornamental lake. Midway between the house and the lake, an amazing terrace surrounded by intricate ironwork gives visitors a reason to stop and enjoy the view. That was breathtaking but so was the incredible mosaic pattern of the terrace itself! Many tons of pebbles were gathered from nearby Bray Beach to build the mosaic on the terrace as well as The Perron. 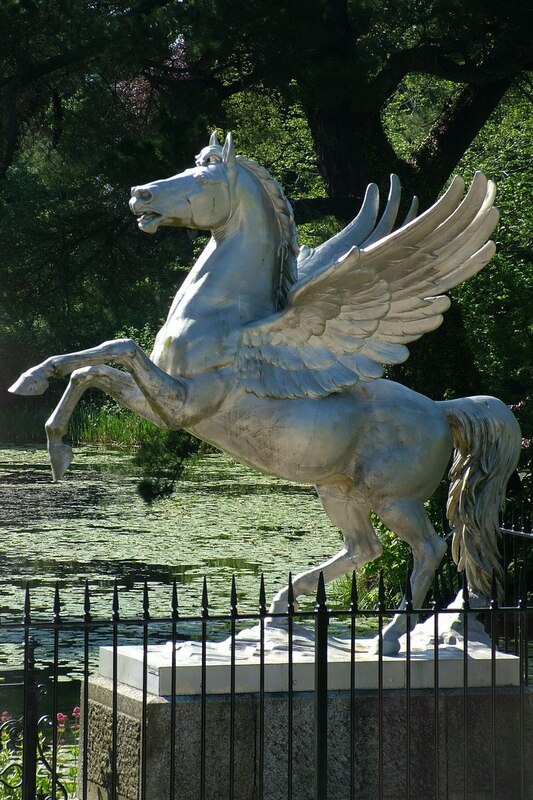 One of the most striking features of the Italian Garden is the pair of life-sized statues of Pegasus, the winged horse of Greek myth. The horses are placed at the edge of the lowest terrace, as though guarding the lake. 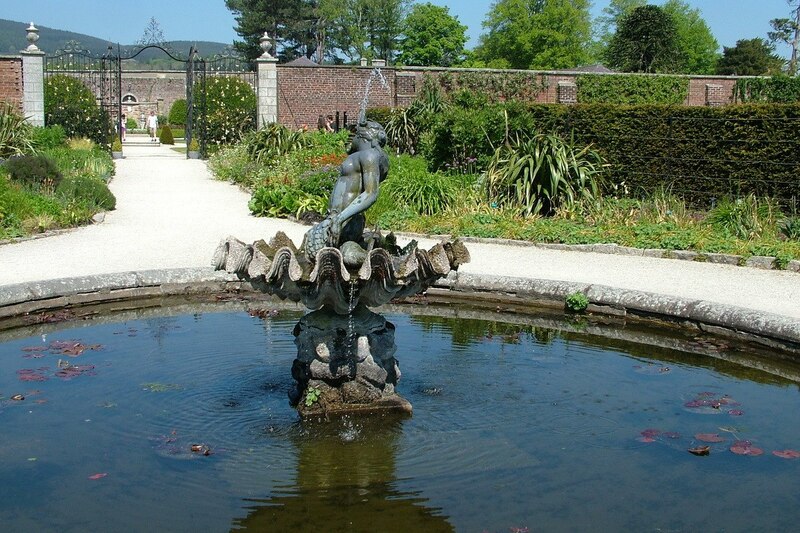 The fountain in the dramatically positioned lake is based on the fountain in the Piazza Barberini in Rome . Standing there overlooking Lake Triton and onwards to Sugar Loaf Mountain, it was easy for us to imagine the elegance and pomp of previous generations. The winged horses are significant because they also are the emblem of the Wingfield family, forming part of their family’s coat of arms. The sheer size and girth of them unnerved me when gazing up from below. Bob and I circled Lake Triton, enjoying it from many different vantage points. Beneath a very clear, blue sky, the sprays of water literally sparkled in the radiant sunshine. Moving on, we next entered into the Japanese Gardens. 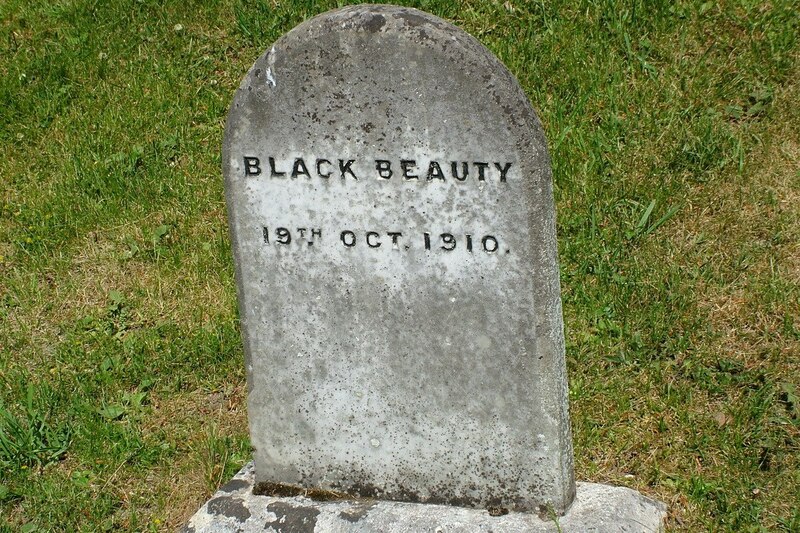 They were laid out over 100 years ago, in 1908, by the 8th Viscount and Viscountess Powerscourt on reclaimed bogland to the south of Triton Lake. 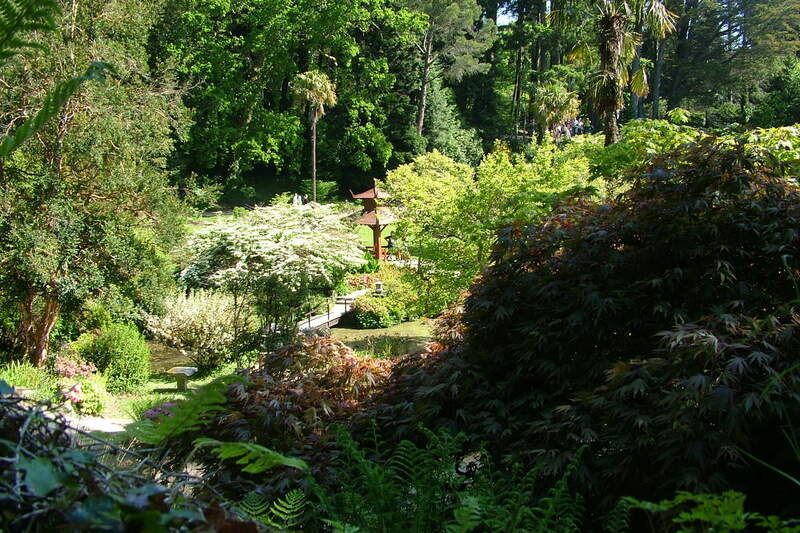 The Japanese Garden is an enchanting Edwardian garden containing Chinese conifers and bamboo trees. Stone lanterns guided Bob and me through the winding paths of the garden, into its innermost circle. There, we found a Pagoda and a narrow stream bridged by numerous pretty Japanese bridges. An unexpected pleasure was when we crept into the confined space of The Grotto. 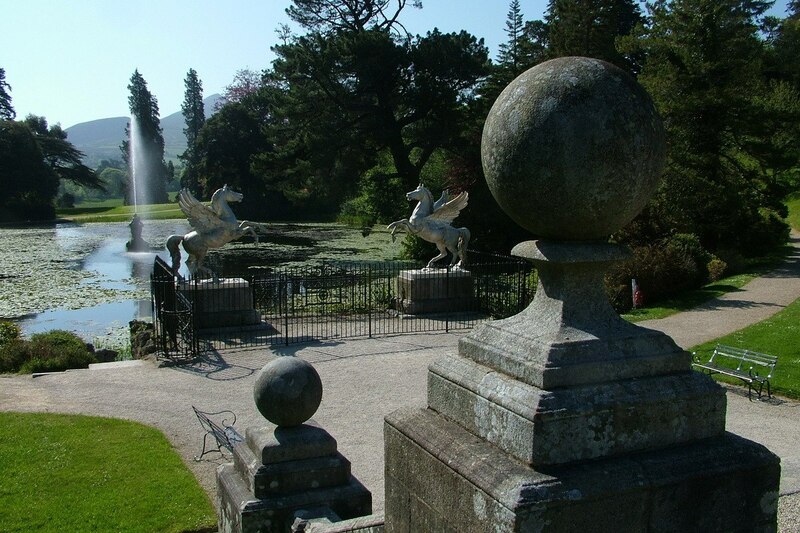 It is one of the oldest features of Powerscourt gardens, dating from 1740. An air of 18th century romance pervaded there, with its secret pathways and romantic atmosphere. 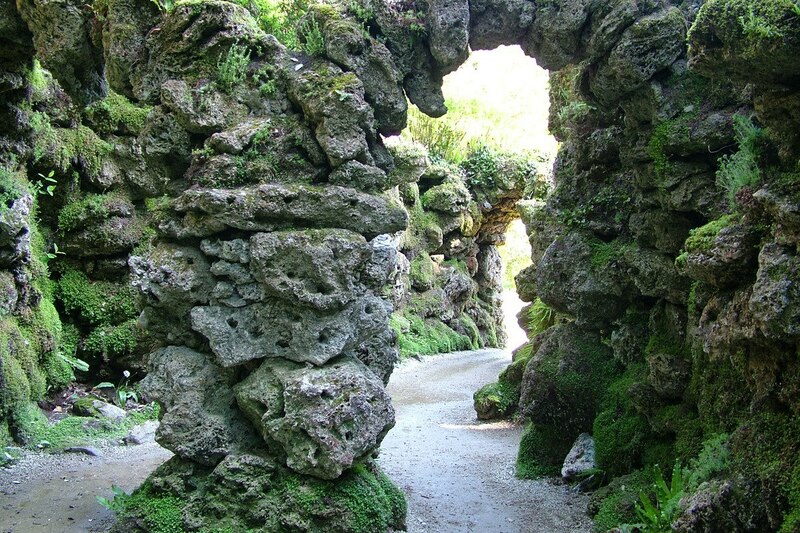 Having the secretive enclave to ourselves, Bob and I took time to listen to the sounds of water trickling down the grotto’s moss covered walls. It was truly refreshing! We left behind the cool retreat afforded by The Grotto and started making our way towards the Pepper Pot Tower. 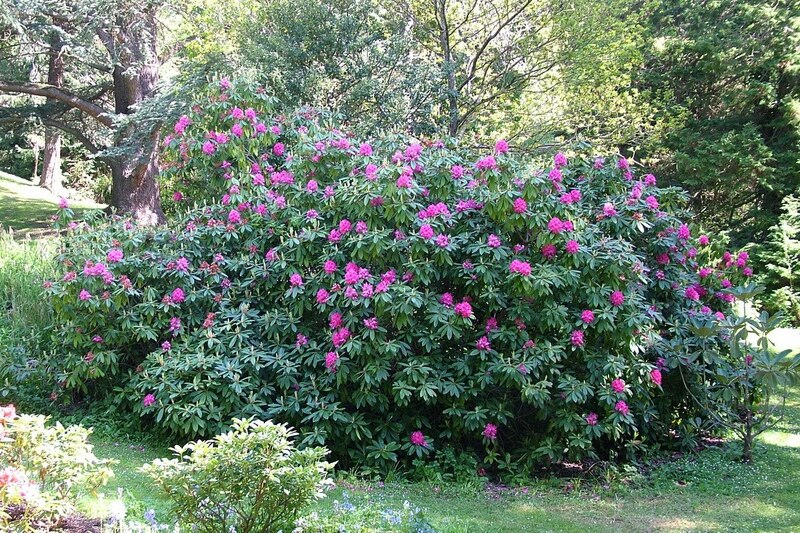 Pleasing vistas of rhododendrons in full bloom lined the pathways. 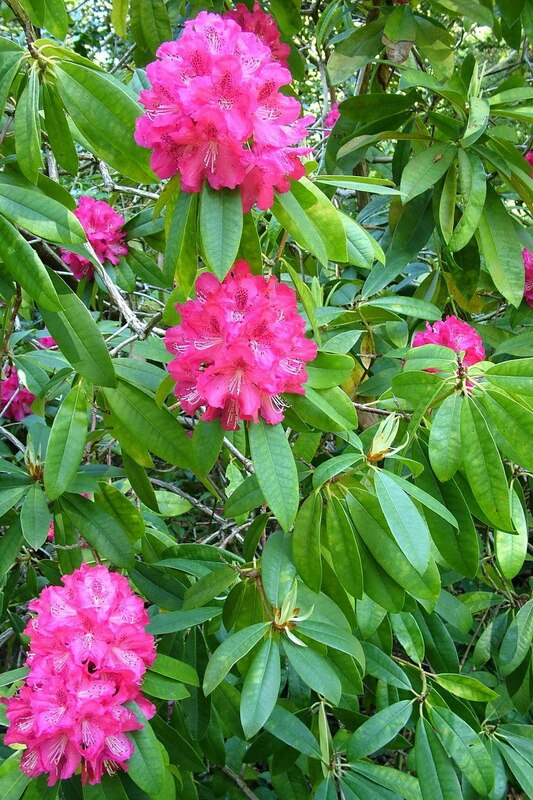 I always admire the flamboyant, showy blooms of this evergreen bush. 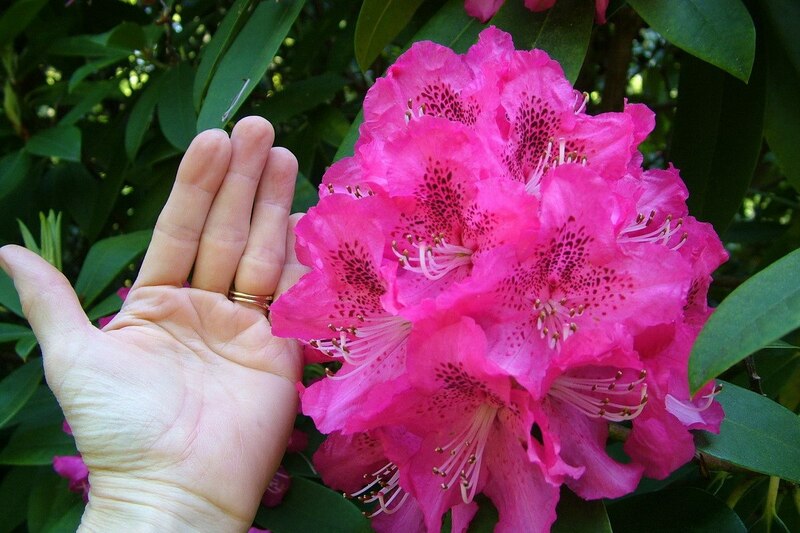 I have a rhododendron in my garden at home, but the flower heads are never as large as those I saw at Powerscourt. They were the size of an inflated balloon! 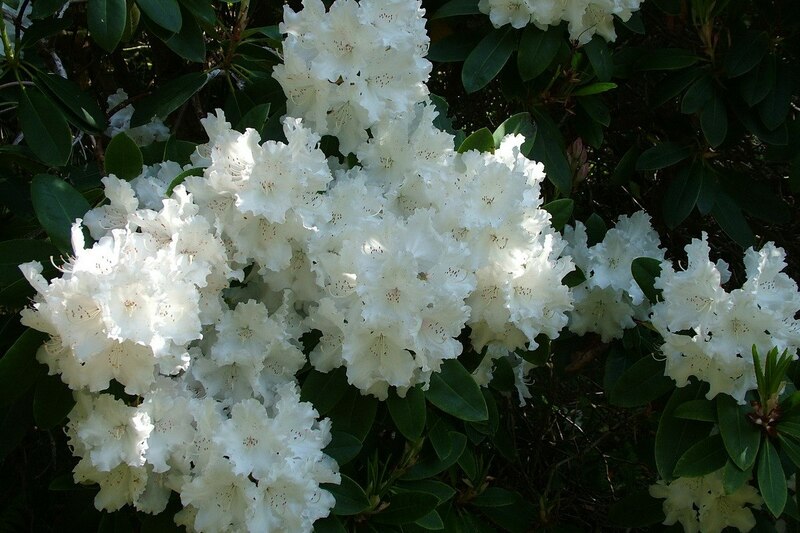 Brightening even the most shaded spot in the garden was a stunning white species of rhododendron. It was magnificent. Bob and I enjoyed a pleasant walk through Tower Valley, mingling with trees such as Sitka Spruce, Western Red Cedar, European Silver Fir, Dan Redwood, Torrey Pine and Giant Sequoia. Their different forms, powerful trunks and intriguing textures made for a very tactile experience as we meandered beneath the forest canopy of the wooded valley. As we emerged from the forest of trees in Tower Valley, we caught a glimpse of Pepper Pot Tower standing prominently at the top of a rise. 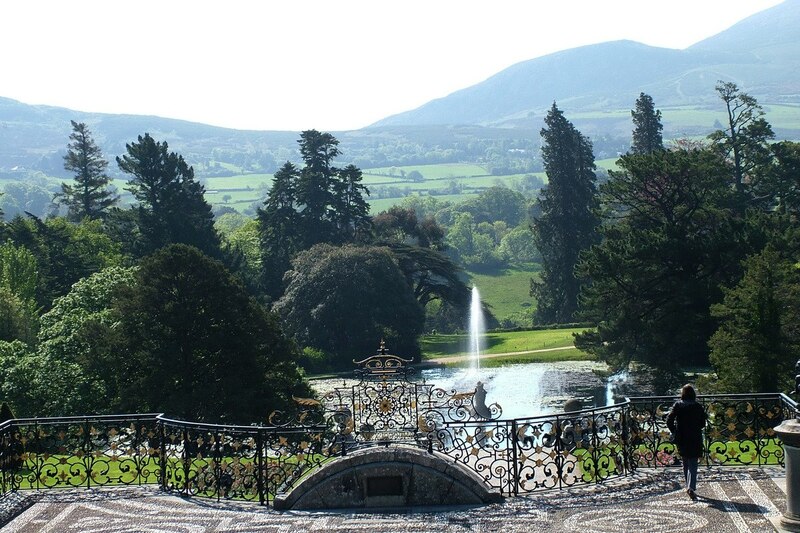 It was modelled after a pepperpot from Lord Powerscourt’s dining table! That is how Tower Valley got its distinctive name. 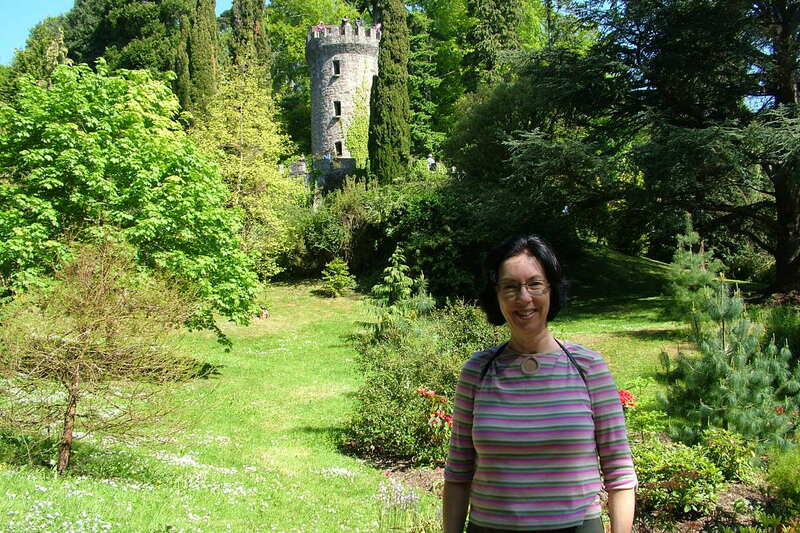 Bob and I surmounted the many flights of the tower’s winding steps in order to take in the views of Powerscourt House and Gardens. 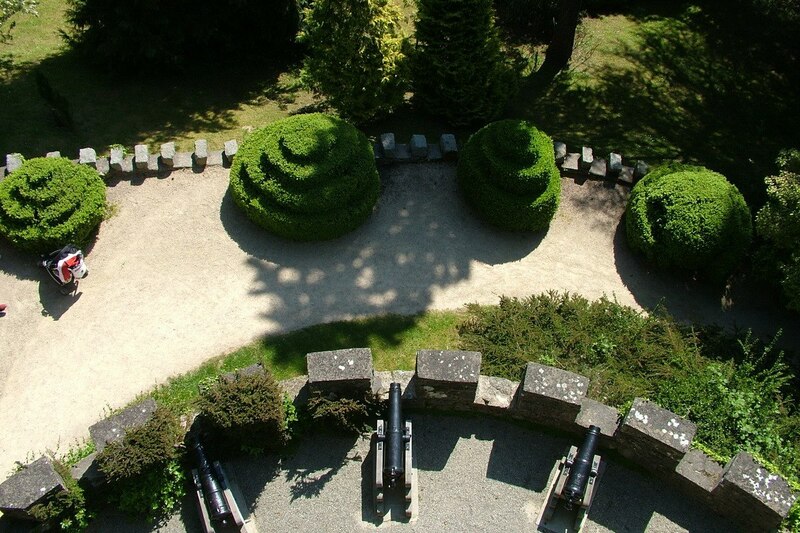 Looking down, we spotted several of the many cannons that surround the tower. 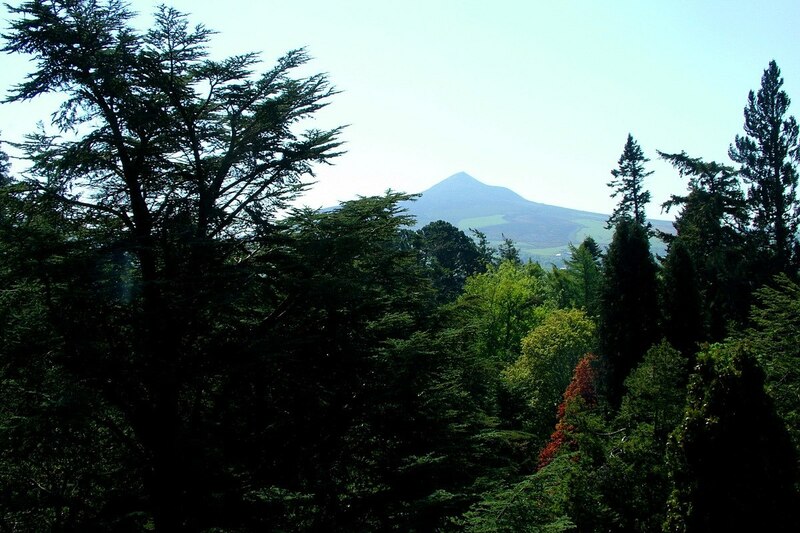 Unlike centuries ago, the view of Sugar Loaf Mountain is now obscured by the trees that have grown to majestic heights. Still, we had a glimpse of the lush green fields that inch up the mountain sides in the distance. 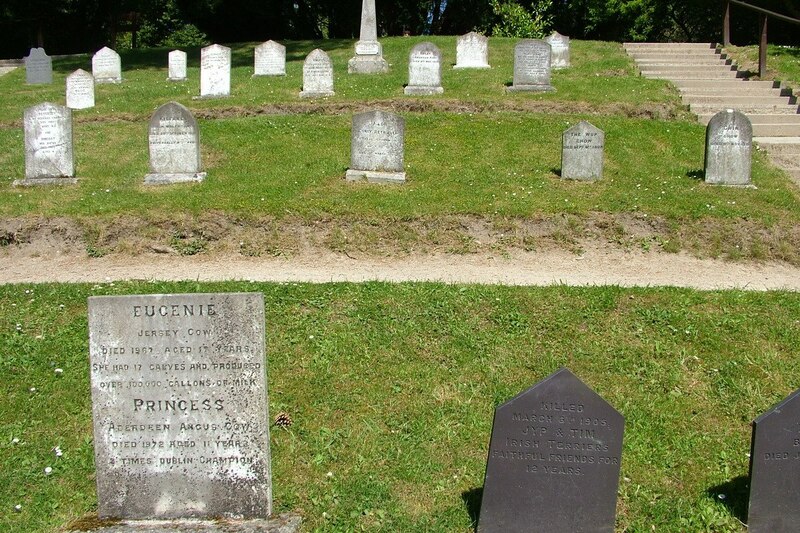 Near our home in Toronto , Canada, there is a Pet Cemetery that we have often visited, so a visit to the Pet’s Cemetery at Powerscourt was a must for we animal lovers. 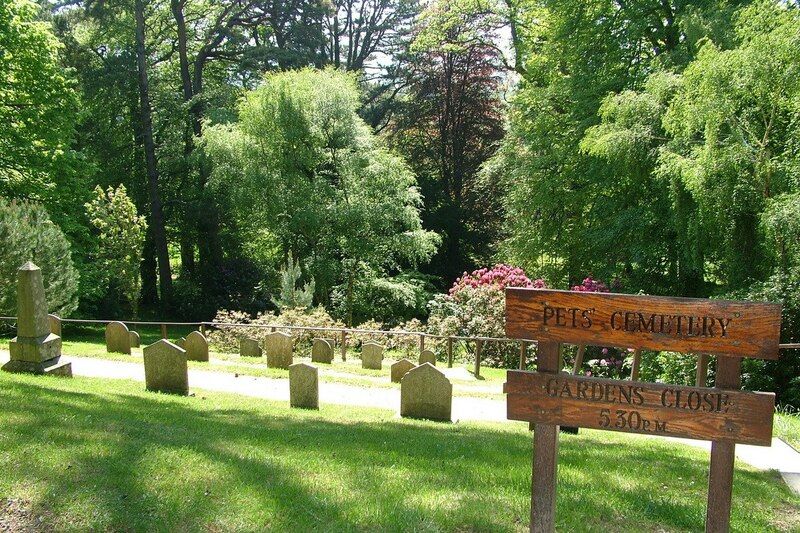 The Pet’s Cemetery is the resting place of the much-loved pets of the Wingfield and Slazenger families. 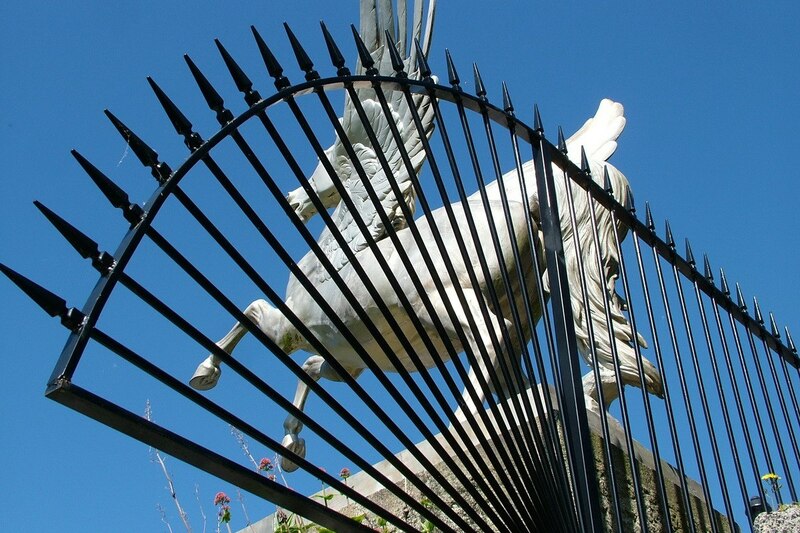 It contains graves of the family dogs, cats and even horses and cattle. 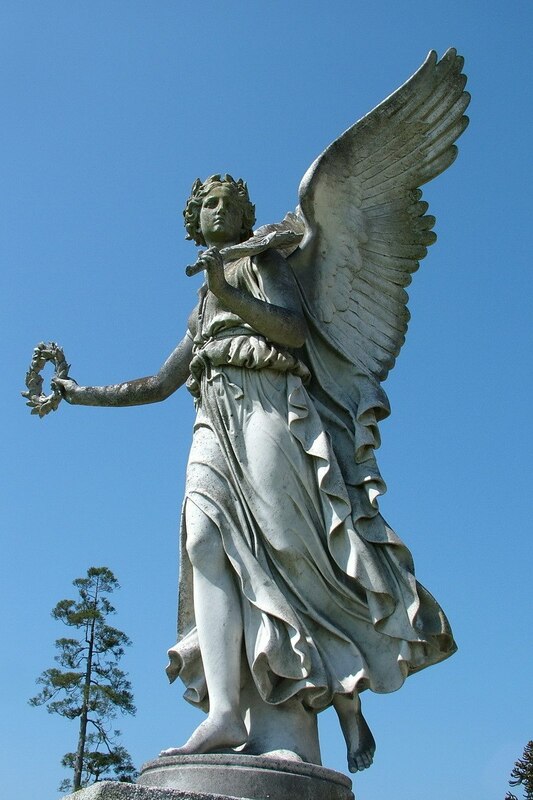 The cemetery is situated in a quiet part of the gardens with a striking view of azaleas, rhododendrons and roses in May and June. 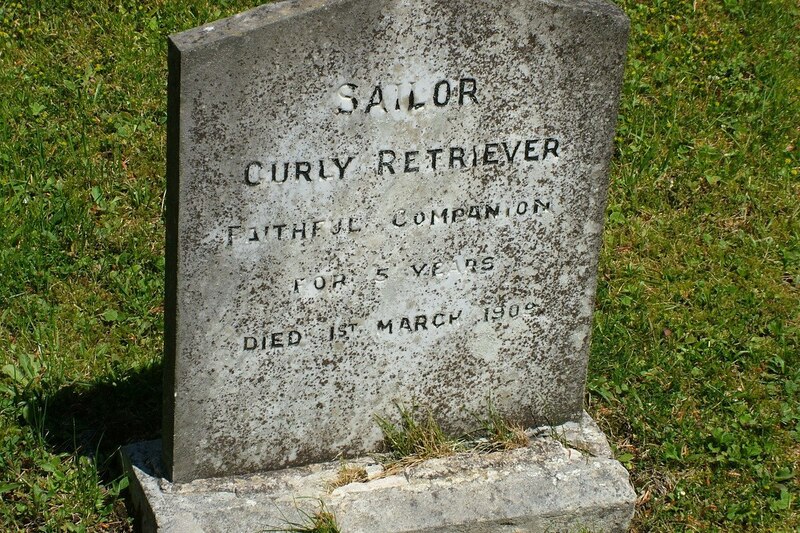 It is believed to be the largest pets’ cemetery in all of Ireland. Continuing our circular tour of the estate brought Bob and I to the Dolphin Pond. 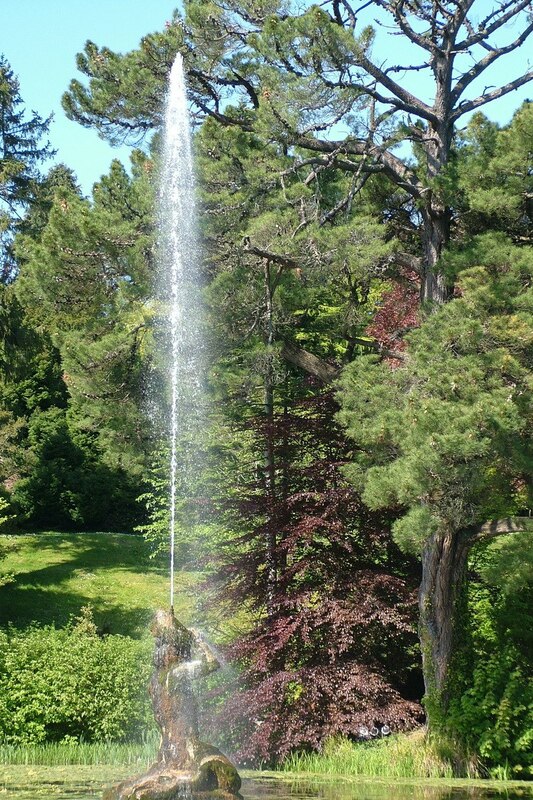 It gets its name from the central fountain that has a jet and dolphins spouting water. 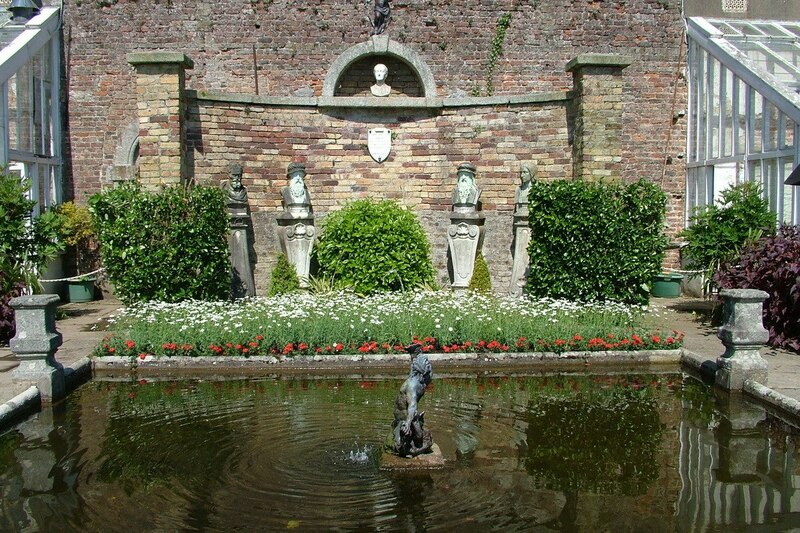 The fountain was brought from Paris in the late 19th century, and is an elegant addition to the secluded garden. With exotic conifers enclosing the space and benches at water’s edge, it made a very private spot for Bob and I to sit and ponder life. Next on our self-guided tour was the Walled Garden, formerly known as ‘The Kitchen Garden’ since vegetable and fruit trees once grew there to keep the family kitchen well stocked. 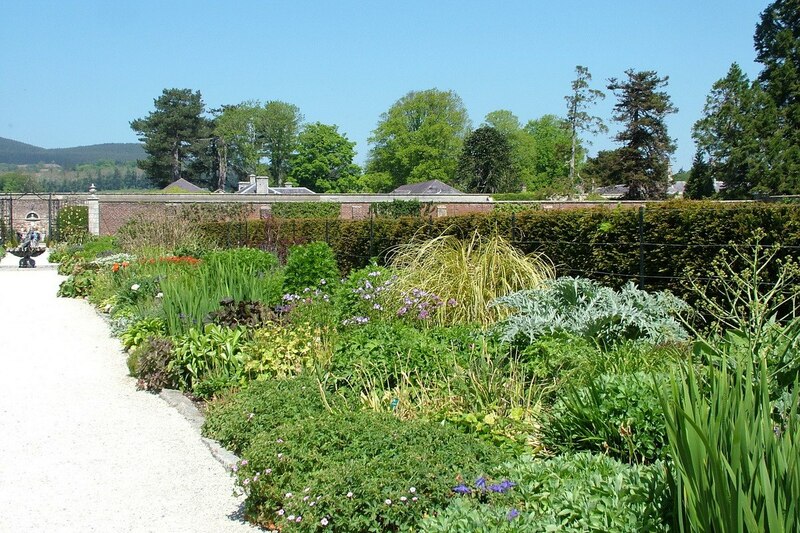 The Walled Garden includes a formal arrangement of clipped laurel trees but is also where nursery stock is grown for all of the Powerscourt gardens. 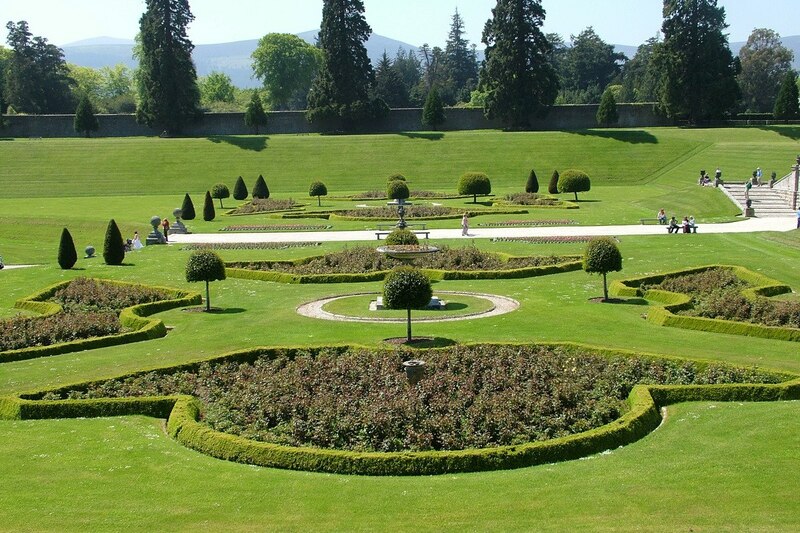 The original selection of plants and shrubs along the herbaceous border at Powerscourt House and Gardens were chosen by Lady Powerscourt, the wife of the 7th Viscount. 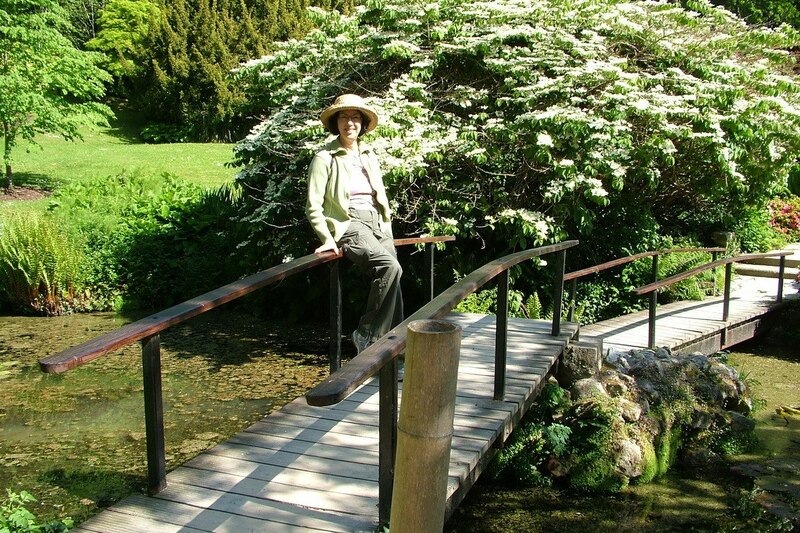 Her husband, Lord Powerscourt, once said, “The planting of the choice plants and shrubs, and seeing them increase year by year in size and beauty has been one of the greatest pleasures of my life.” I couldn’t have said it better myself. 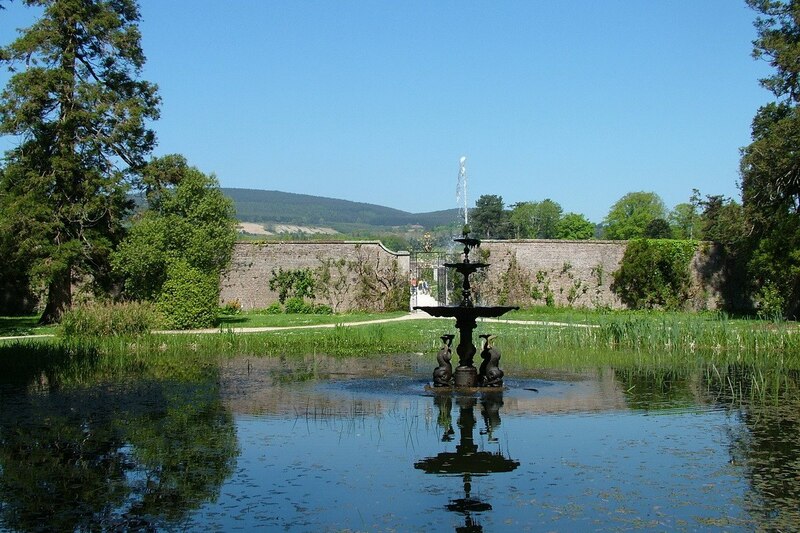 The Walled Garden is one of the oldest parts of the Powerscourt Gardens and features fascinating plants along Ireland’s largest herbaceous border. 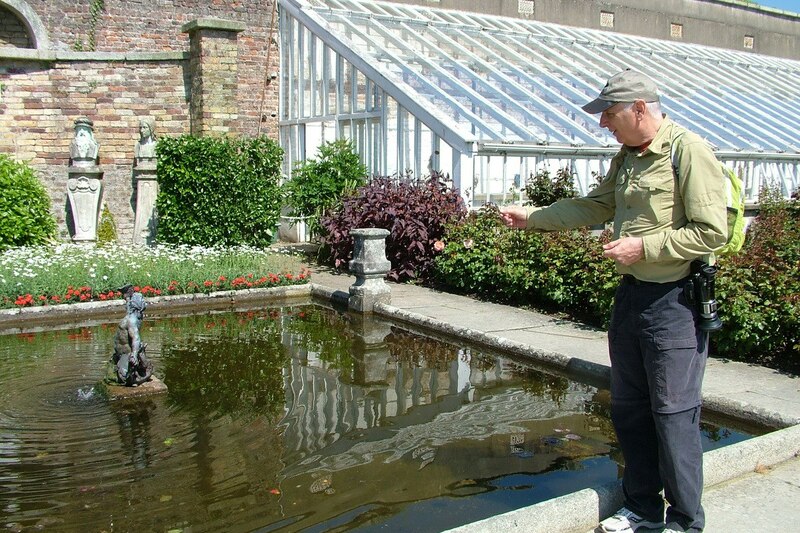 In the Walled Garden, Bob and I also came across Julia’s Memorial, a calm reflective pond built in honour of the 7th Viscountess by her son. 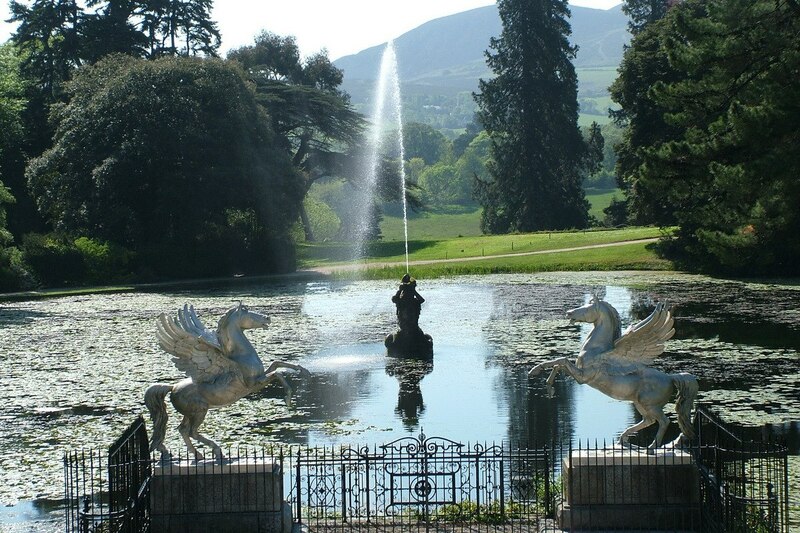 Reflective water features were numerous throughout the grounds of Powerscourt, a testament to the belief by the former owners of the property in peace and solitude as a restorative agent. Bob tossed a coin for good luck into this, the last, pond we visited that afternoon. After spending 2 1/2 hours touring the various gardens, we ended up back in the Italian Garden. 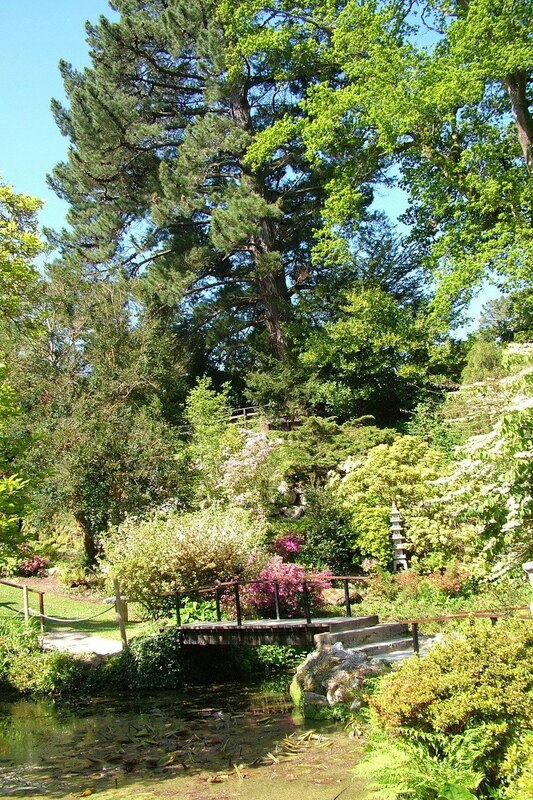 We wanted to have one last look at the magnificent Italianate stairway that is the central feature of the Garden. That image will remain in Bob’s and my memories as a lasting impression of the grandeur that once was commonplace there at Powerscourt House and Gardens. 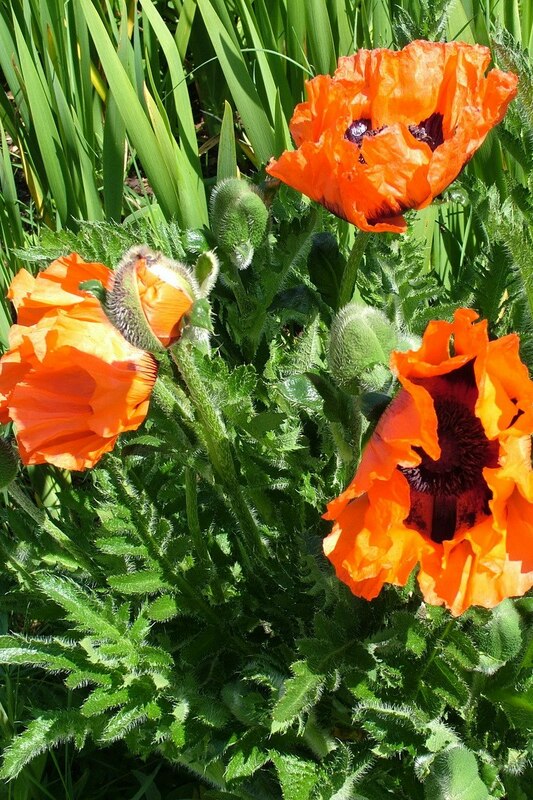 How marvellous to see all these photos taken on such a blue sky day.Wonderful blog post Bob and Jean. Thanks, Hazel. We were very fortunate with the weather when in Ireland. On several occasions, we underestimated the warmth of the day and found ourselves overdressed, but Bob and I were always glad to see the inviting sunshine.